The Old Haberdashery had so much to choose from and Sonia had told me she had made a trip to France as well so you can imagine can you not the choices that lay there before me. With Threads and lace and buttons. I decided I have a button mountain and not to look to deeply because if I never bought another mother of pearl button again my stash would out live me and my sewing days... So I concentrated on some other bits and bobs instead. Now then my absolute pride and joy and it was from Carla Wall .. This is a 1895 ish Wedding Box. It is caved wood and it has hearts and all sorts carved into it. It is like a sampler on a wood box. Carla bought it in Norway but she said it looked very Amish and I agree. It has a definite Pennsylvanian feel about it and we discussed it. As she bought it in Norway she can not absolutely be sure. Personally I really do not mind where in the world at that point in history, where is came from. It is absolutely stunning and I can not thank Carla enough for finding it and selling it to me. I am totally in love and will cherish this beauty forever. From the lovely Holly of The Painted Anthology I purchased this gorgeous bucket and the seed packets. I have not planted it out yet but it sits on my outside table right now aka my summer stitchery office and I stare at its beauty and the words that I know and love so much. and the words that meant something to us. My husband is very handy with anything DIY and so we have been sitting talking on what we can do. I promise a photo will follow when we have fully decided where to pop them. papers and these are fabulous for mixed media pieces with the old writing and rather old dates on them. I love to water colour softly over them or add fabrics and embroidery. Three more pieces for my little stash and I will design something lovely for these very soon. From Emma of Little Wren Vintage well the list kind of goes on. I bought some pieces of absolutely stunning antique quilt pieces. I am not sure the camera has done full justice to these because actually too much sun does not give a great photo but I tried my best. I will be using them very soon and have lots of ideas for them already. Then we bought this most lovely old mirror. 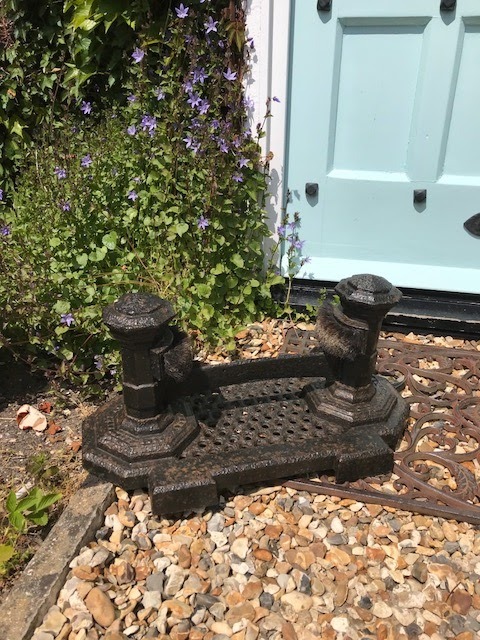 It is in mint condition and has the carving of flowers around it. We have put it in our guest room on the wall right now and it is so beautiful I keep going in and looking at it. Of course when our lovely friend is here I will not be creeping around in there ... Although he totally gets me and I guess that is why we are best friends for life. He would be laughing if he were reading this but I am typing whilst the house still slumbers... soon to be coffee and breakfast time and the laughter begins then! Then this was the large item, a chair. It is Edwardian and a small chair, probably for a boudoir originally but Emma has had it re sprung and it is covered in antique cream linen .. that is except for the back which is in a antique red and white check fabric and I am in love. It fits in so well and we both are really pleased with it Emma. You are a star! Now do you like the chair. The reason I have the blanket over the top right now and a cushion on the seat is because Emma is making me a cushion out of the same fabric as the backing for the chair and I am going to make a little something for the top save any soiling from hair rub etc. It is not a removable cover and so I want to protect it when sat on it but for now this is how it is to protect it from any dirt. It is so very comfortable and because I am short my feet actually touch the ground and that makes it a great chair in the winter or colder days to stitch in. Next to it on the pictures left is a little table with a lamp on it and some family photos. Then the other side of the table is a red and white check chair which is a little large .. they look perfect together and both my husband and I are over the moon with it. Lastly we bought home with us a light blue and cream quilt. We have not actually paid for it yet. Emma had hung it on the marquee wall as a backdrop and there appeared to be water marks on each edge. We looked at it, discussed it, bantered about what else it could be as they were not there when she hung it up. So I have taken it on to wash it this weekend and see if they come out. Depending on the out come as to whether its a keeper as a quilt or it goes to cut up for cushions by Emma or some such. It would be a crying shame if that is the case but we will get together and see. If all is well then I will photograph it for you to see another day. The bluebird of Happiness was the stall with all the gorgeous epherma and book plates and as I said to you yesterday it was a mixed media or journaling paradise indeed. I was there around 40 minutes and I am not kidding. I was leafing through and wondering at the antique papers there for purchase. I was restrained but will go and see this lady again for sure. more rustic in texture and that is wonderful to cut up and embroider on. Happy was I when I found it for my ever growing linen stash in my armoire.. It will be used as I have a project waiting for some linen like this. Then I spotted some very old French maps in a fold out book form and again mixed media work and will be fun and great to work with... They are dear little things and I love them. Then of course as I told you yesterday Kate was there of Oyster Bridge and her ribbon words were there. I picked up some great ones and of course I still have to make my order with her. These however will do nicely in the meantime and you will see the words in due course over the next few weeks I should suspect..
believe anyone had not walked away with. It is red and white and it has strawberries around the edge and a monogram in the middle with embroidered little strawberries as well. It will not be cut up but will be a much loved cloth in our home on one of the tables this summer and I love it. I am always drawn to red and white so it will come as no surprise to some of you .. well Dawn at least! lol. The Cranbrook Iron stall had all the outside rusty metal work magpies and hares and chickens and we stood and we pondered and we discussed. I love Hares as you all know by now the boxing hares were outstanding. Then of course their was the magpie with shiny keys in its mouth and you know my fondness for the Chuckle Brothers that come visit us most days and hang around the pear and elderflower tree. Throw peanuts at each other then finally eat something and lastly they have a bath and a drink ... so what to choose. Then we saw the chickens and well Mo you know how I love those as you do ... So yes you guessed it we had some of each. would have had some explaining to do ... So it was not until the Sunday that we popped them where they are. I thought the birds would be a little unhappy and that Miss muddy would have had a melt down but no it was all accepted the same day to our happiness and joy. 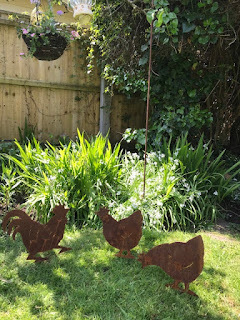 The chickens under the pear tree on the lawn and in front of a shepherd hook that has glass jar full of twinkling fairy lights on at night when we are sat out there look amazing, well everything does. 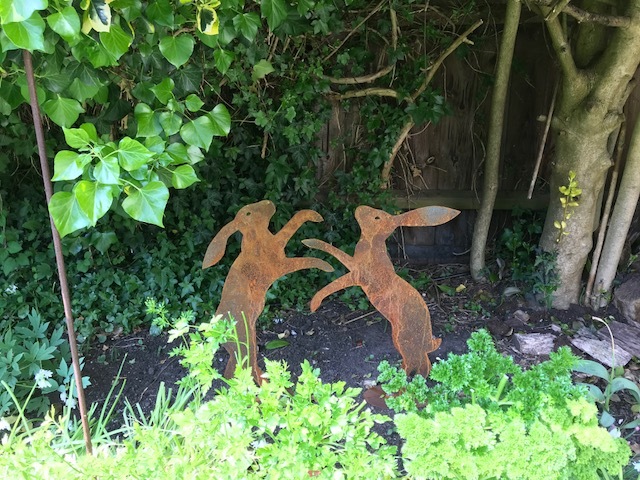 The boxing hares we can see from out table and chairs as we can Magpie with the poppy seeds that we bought last year. There are twelve jars with fairy lights around the garden on the shepherd hooks and it looks so very pretty. It is now Bank Holiday and so there will be no blog next Monday I am afraid. I am having a long weekend with my husband and our great friend. It is our friends Birthday too so we are out to dinner on Saturday night and have lots of things planned. I hope the sun shines for us all and that you have a great Bank Holiday weekend if you are in England and a fabulous weekend even if you are not. 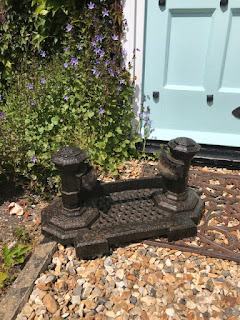 Leaving you with one last photo and that is the gift given to us by the lovely Emma of Little Wren Vintage as a gift for us for helping her pack up. A stunning hydrangea bush that is is a pot now and with gorgeous pink, huge flowers. Wow!!! I think when you move to your forever home Sarah that you might just need a fleet of removal vans 😂. Gorgeous treasures. Love the chickens and the hares, they look amazing in your garden. You and Andrew have fantastic taste and seem to complement each other with your finds. I absolutely love the delicate lace trim with bobbles, passementerie. I purchased some vintage French flower labels and have lost them!!! I hate losing things. Thank you we love our tag team of truffling! I know what you mean moving is going to be fun!!!!! It was a fabulous fair and again the views are magnificent! Oh you have lost your little labels, you will come across them unexpectedly I am sure. I hate misplacing things too! It’s fustr apart from anything. Have a wonderful Bank Holiday and hope your garden project is coming along nicely! Love this read. 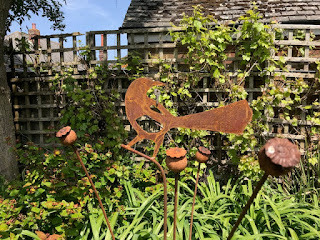 I love all the rusty garden silhouettes ...a magical place you have created outside. I love the chair and the mirror. The seed packages are special too....such fun. It is Memorial Day weekend in the US. Have a wonderful bank holiday weekend with your friend. Memories are being made!! Thank you so pleased you liked the read and photos. 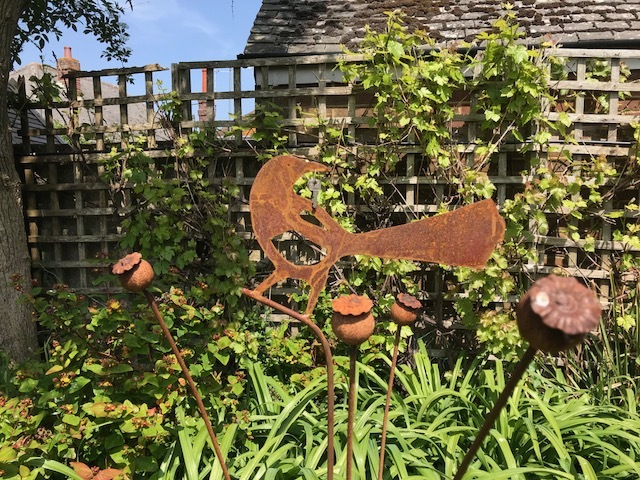 The rusty garden ornaments are divine and look lovely..
have a great memorial weekend and enjoy with friends and family too. Let’s hope the sun shines for us all. Hi Sarah, I am slowly playing catch up. What a heavenly fair that sounds - will add it to the list. I absolutely adore those hens - how delightful. They'll do nicely until you get your own live ones.